Bogdan Vernescu has held a variety of positions during his time at WPI, and is currently Professor of mathematical sciences and the Vice Provost for Research. His research is in applied mathematics for multiscale materials sciences, focusing on the characterization of material properties of composites, porous media, suspensions, emulsions and lectrorheological/magnetorheological materials. He has published over 60 research papers, a monograph and a proceedings volume. 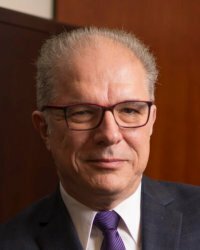 He has held visiting positions at MIT, the University of Metz, University of Nancy, University of Savoie, University of Rouen, University of Rome La Sapienza, and at the Institute of Mathematics of the Romanian Academy. In 1997, he co-founded WPI’s Center for Industrial Mathematics and Statistics—which developed mathematics and statistics research projects for the corporate world—and served as its director until 2003. From 2003 to 2013, he was the head of the Department of Mathematical Sciences; under his leadership, the department’s external funding more than doubled, the number of postdoctoral scholars and PhD students more than tripled, the first chaired position was successfully filled, and several new degree programs were developed. In 2007 he became the Founding President of the National Professional Science Master’s Association (NPSMA), and served two terms on its board of directors. In 2018 he was appointed by Governor Charlie Baker on the Advisory Board of the Massachusetts Technology Collaborative (MTC). He is currently a member of the Technology and Leadership and Strategy Initiative (TLSI) Chief Technology Officers Roundtable, at the Council on Competitiveness, on the Board of Directors of the National Defense Industrial Association (NDIA) New England Chapter, and a Trustee of the Romanian American Foundation (RAF). Vernescu earned his BS and MS in applied mathematics at the University of Bucharest, and his PhD in mathematics at the Institute of Mathematics of the Romanian Academy. Congratulations NDIA-NE for being named a NDIA Model Chapter since 2014!